I’m going to have to apologize to all my international friends today, because right now, it’s all about Team Canada. While the winter Olympics and Sochi are quite a ways away from Canada, I think we’re all still showing that Canadian pride that took off during the Vancouver games of 2010 – it’s infectious. There is just something so special about watching these elite athletes compete in the games. They train their whole lives for this, and sometimes, it comes down to a 20 second race or a 5-minute program. It’s unbelievable. 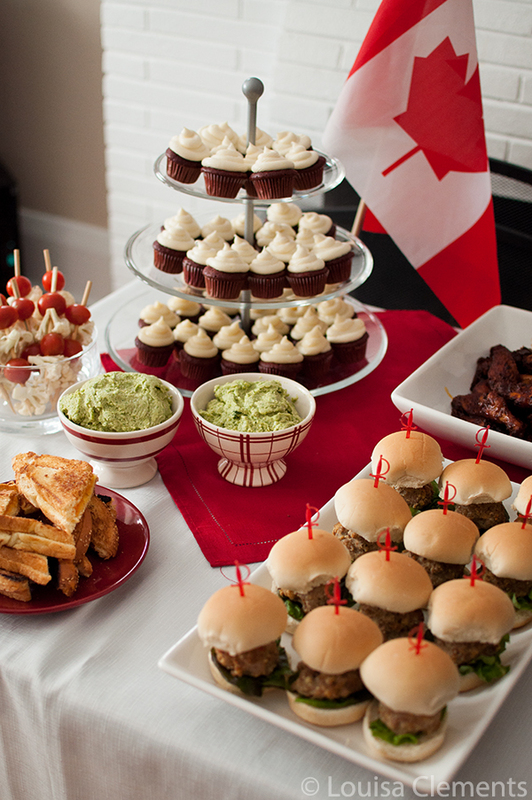 I wanted to show my support for the Canadian olympians on the other side of the world so I threw a Team Canada party. What makes a successful Team Canada party? The food. Now, you might be thinking that I don’t have the “classic” Canadian dishes represented here, and you’re right, I didn’t make poutine and I didn’t make Nanaimo Bars because, quite frankly, they aren’t my favourite foods. Instead, I opted for some fun game-day snacks like chicken wings and dips. I also tried to keep to as much of a red-and-white colour scheme as I could, because at a Canadian Olympics party, there needs to be a lot of red and white, maybe a bit of gold too. 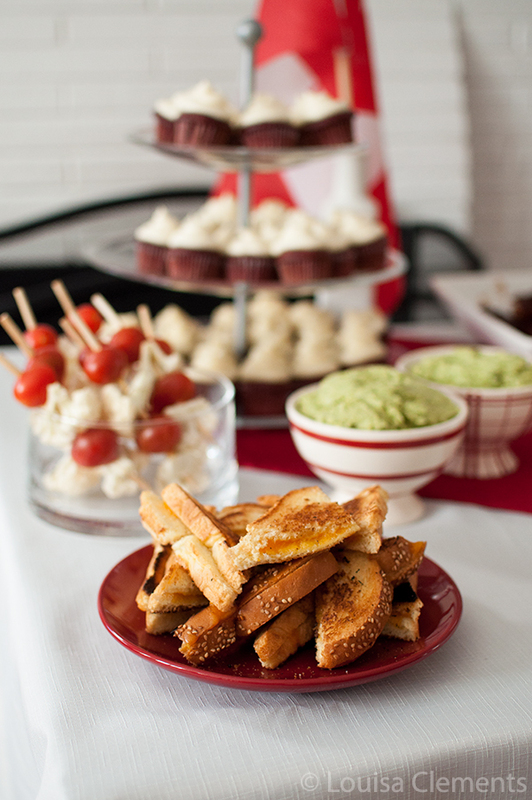 There’s still lots of time left to throw your own Olympic party (hockey, anyone?) so get planning! The great thing about this menu is that the Avocado Feta Dip, skewers, barbecue turkey meatball sliders and the red velvet cupcakes can be made the day before. One thing that I’ve learned through hosting a few parties here and there is the more you can do the day before, the better, especially with a party like this one, you want to be able to enjoy the events! Don’t forget to enforce a strict dress code; red and white only. Thanks, Natalie! I really love that idea making a meal from the hosting country during the opening ceremonies - I might have to do that next time! 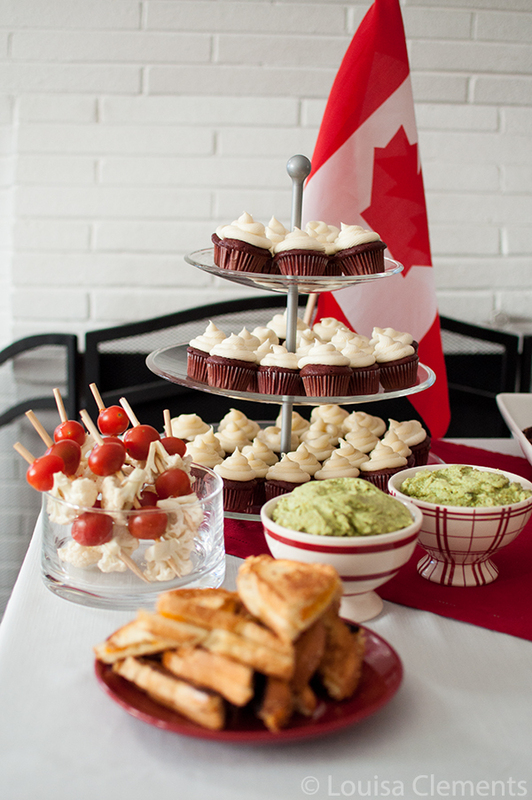 Love your idea, your choice of foods & your Canadian presentation! Must do this for friends for the Opening of the 2018 Winter Olympics!